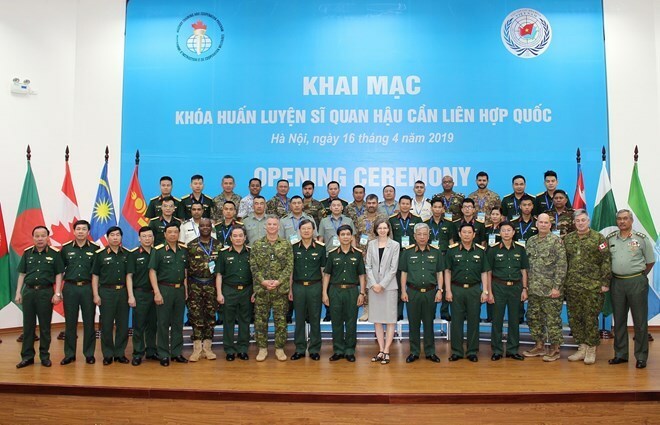 Maj. Gen. Hoang Kim Phung, Director of the Vietnam Department of Peacekeeping Operations (VDPO), said the course will provide training for 28 officers, consisting of 13 from Vietnam and 15 others from 10 partner countries of the Military Training Cooperation Programme. Running until April 27, it will feature five lecturers from Canada and Sierra Leone, and two from Vietnam. At the opening ceremony, Deputy Defence Minister Sen. Lt. Gen. Nguyen Chi Vinh, who is also head of the Ministry of Defence’s steering board for Vietnam’s participation in UN peacekeeping operations, said that over the last seven decades, UN peacekeeping activities have proved their important role in recovering and maintaining peace, including rebuilding countries after conflicts. In those operations, Canada has continually been one of the leading contributors, with over 125,000 military and police officers sent to UN missions. It has also been a key driver in proposing important initiatives that have won high consensus, said the deputy defence minister, thanking the Canadian government and Department of National Defence for creating conditions for the two sides to organise the UN logistics officers’ course. Vinh also asked the VDPO to increase coordination with other countries, especially with Asian-Pacific nations and those who have cooperated with Vietnam, to hold more activities in the field of peacekeeping. Meanwhile, Canadian Ambassador to Vietnam Deborah Paul said ensuring logistics is critical to the success of UN peacekeeping missions, noting that through this training course, participants will acquire useful knowledge for their tasks in the future.